How does the Duchess of Cambridge keep her long hair looking good? Why did Bella Swan fall for Edward Cullen? Where did my chocolate bar go? Building and solving mysteries is at the heart of writing. From the questions in your teaser to the need to know more that draws a reader from the first page to the last, all stories are about mystery and suspense, no matter what the genre. The best stories start with a question. What happens if a vampire loves a human? What will satisfy the Very Hungry Caterpillar? Can the Little Mermaid win herself a soul? How did Pi survive the shipwreck? Some authors answer all the questions, but some leave you hanging. What questions does your writing ask and how will you answer them? What questions do your readers have and have you answered them to their satisfaction? Whilst only you can answer the first, writing sites like Wattpad and Widbook can help you answer the second. Take comments on board and let your readers help you shape your story. I wonder how much better Tolkien could have made Lord of the Rings if he’d been able to talk to his readers as he wrote. The devil is in the details – your readers can tell you if there’s too much, too little or it’s all too confusing. In Australia, a thong is a shoe. In the rest of the world, I understand it’s a different piece of attire entirely. Some brave readers on Wattpad kindly cleared this mystery up for me. I’ll never look at my Italian leather thongs the same way again as I slip them on my feet. Releasing a book is all about suspense – is the cover attractive enough? Does your book description tantalise a prospective reader enough to make them want to read the first page? 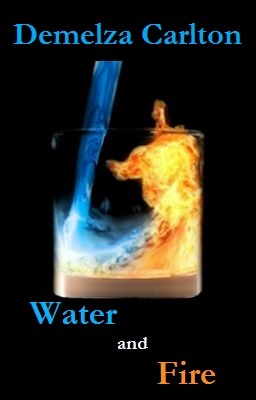 Both Widbook and Wattpad have helped me answer that – from one cover to another, Water and Fire certainly is more attractive when the cover isn’t actually on fire. Perhaps being on fire only works for couples in YA fiction like the The Hunger Games? All of my writing is about solving mysteries. With the serialised novel I wrote for Wattpad, which will be published on 30 July, Nightmares of Caitlin Lockyer, the mystery lies in Caitlin’s mind, starting with the night Nathan finds her on a beach covered in blood. I asked Wattpadians to join Nathan in his journey to discover who tried to kill Caitlin and stop it from happening again. Almost a million have accepted my invitation so far – and the number keeps growing. Of course, the solution to some mysteries is different – a paranormal, fantastical element that you might never have considered outside the realms of fiction. Mermaids. Anything that went wrong in the ocean, you can be sure mermaids played a part in it. I’d pin any shipwreck on them and possibly the loss of my chocolate bar, too. Mermaids have quite a taste for chocolate. Mermaids have infiltrated my writing, too, in my Ocean’s Gift series – which includes both Ocean’s Gift and Ocean’s Infiltrator. Where to from here? I’d like to keep that a mystery…though with the Nightmares Trilogy and the Ocean’s Gift series, the possibilities are endless.